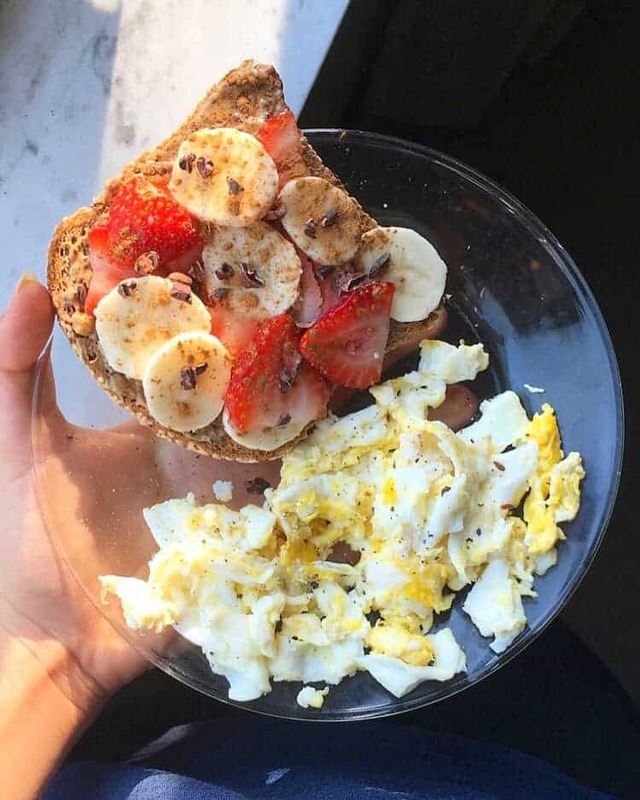 I woke up craving sweet and salty and smooth and crunchy, so loaded toast and eggs it was! I’ve been rotating between smoothie bowls and the toast egg combo as of late. My go-to toast toppings are Nutzzo 7 nut and seed butter, sliced strawberries and bananas, cinnamon, and cacao nibs for crunch. I did a sampling local sampling of Alchemy goodies in the morning so a matcha no-bake bite made its way into my belly as well. 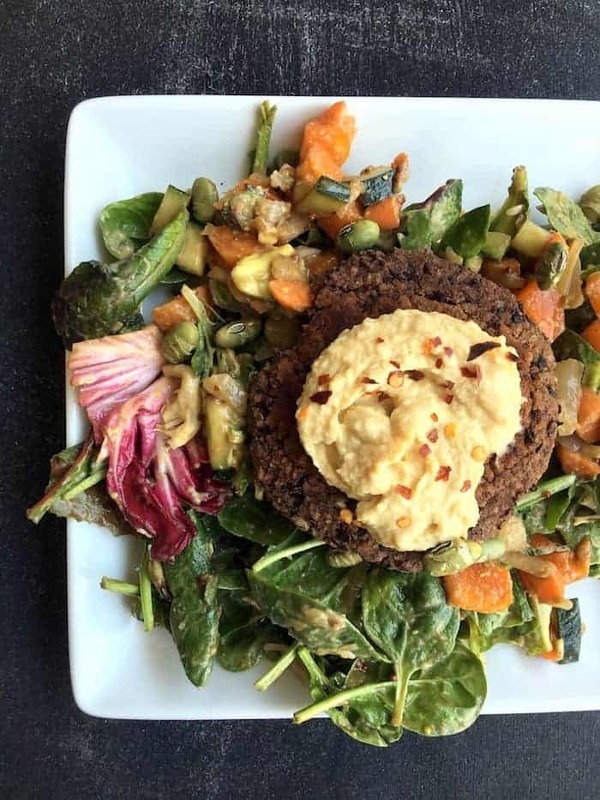 Lunch was a hugh jass salad with mixed greens, carrots, peppers, cucumber, avocado, dry-roasted edamame, Cleveland Kraut whiskey dill sauerkraut, and an Easy Vegan Black Bean Burger. For the dressing, I simply added balsamic vinegar, Oasis roasted garlic hummus, and Trader Joe’s whole grain Dijon mustard to the mix and gave it all a good stir. It was creamy and delish and totally satisfying! I also had a juicy pear. Afternoon snacking included taste testing our new jackfruit sandwich, a Roasted Strawberry Oatmeal Cup, a few handfuls of cinnamon roasted chickpeas, and some random unpictured almonds I found in my bag while I was getting my nails done. The boyf and I went to Local Cantina for dinner in honor of Taco Tuesday. We shared a spicy margarita and plenty of chips and salsa before taco time. Veggie tacos with black beans, tomatoes, cabbage, guacamole, and chipotle agave for the win! As if I didn’t have enough corn at dinner, I snacked on some Simple Truth organic popcorn and one of my beloved So Delicious Coconut Minis after dinner. Post-dinner snacking is a precious, precious time. See you tomorrow for something super tasty! My family said you were a delight. Jackfruit sandwich?! Chipotle agave? Can I come eat with you everyday?!! Jackfruit sammy at Alchemy?! Can’t waaaiiitt! I love a good toast/egg combo too! I’m a creature of habit when it comes to breakfast and I usually do eggs with fruit, or oatmeal with nut butters. Can you believe I’ve never had tacos? I need to change that ASAP! no way! tacos aare little bites of amazingness wrapped in corn tortillas & you haaaave to make them! The balsamic dressing with mustard and hummus sounds wonderful. Have to give that a try. Hahaha, the Hugh Jass comment went over my head the first time I read it.